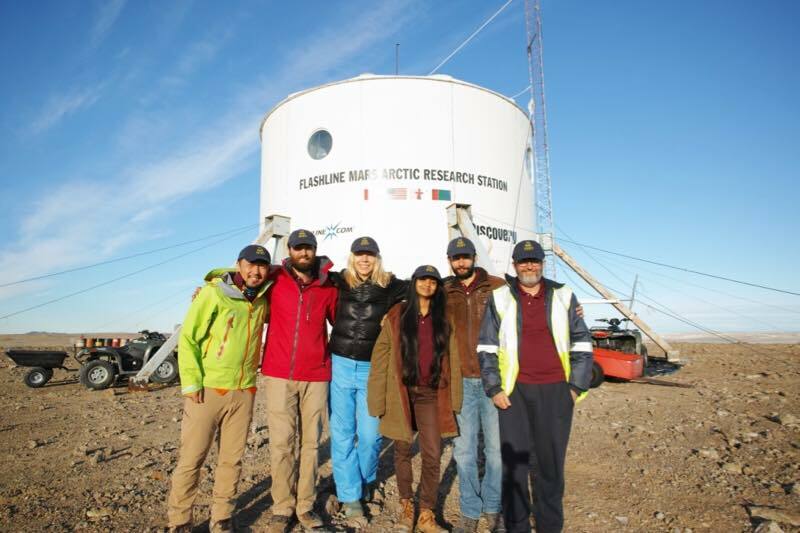 Continuing its leadership in high-level Mars analog research, the Mars Society is pleased to announce that the second half of its Mars 160 mission has officially begun with the arrival of a six-person crew this weekend at the organization’s Flashline Mars Arctic Research Station (FMARS), located on Devon Island in northern Canada. Mars 160 is a unique two-part mission involving a sustained program of advanced field exploration and testing in Mars-like terrain, initially in a desert setting at the Mars Desert Research Station (MDRS) in Utah last year and now in an arctic environment at FMARS, operating under many of the same constraints that human explorers on the Red Planet would face. The dual program is intended to carry out nearly identical field analog research in order to determine how mission location affects science return. During its Canada-based simulation, the crew will carry out a wide variety of Mars-relevant research, focusing on areas such as geology, microbial and lichen ecology, science field protocols and small group function in isolated environment research. The mission’s second phase is being coordinated by two principal investigators: Dr. Shannon Rupert, Director of the MDRS program, and Paul Sokoloff, Senior Researcher at the Canadian Museum of Nature. "Mars 160 is a unique mission that combines and compares both desert and arctic Mars analogs as field test environments for Mars mission operations research. The Mars Society has opened up this vital field of research, which is now expanding worldwide. With this mission by an outstanding crew drawn from four continents, we will advance it substantially. On to Mars! ", said Mars Society President Dr. Robert Zubrin. For regular updates and photos about the Mars 160 mission, please visit our Mars Society web site (www.marssociety.org). Also a full review of Mars 160 will be presented at the 20th Annual International Mars Society Convention, scheduled for September 7-10 at the University of California Irvine.